I am so excited to be playing along with this year's Rainbow Scrap Challenge. So, excited that I am working on four different quilts for the challenge. I had so much fun last month with the color blue. Check here for the post on last month's blocks. February's Rainbow Scrap Challenge color is brown, with touches of pink. Brown just didn't work for me in any of the quilts. So, I decided to use the colors in my February comfort quilt. I had a lot of brown and pink fabrics lingering in my stash that I was no longer in love with, and some fabric given to me by friends that I just didn't love. I knew that some little cuties would love these fabrics so, I got to work. Then, I drew up a quick plan. Super simple and fun. Before I knew it, I had enough blocks for 2 little quilts! I used even more of the scraps making scrappy bindings. They each finished about 41 x 54 inches. I am so excited to have used up some stash, and have TWO quilts this month to donate. Success!! WOW!! I am SEW impressed by your productivity. Keep up the good work!! 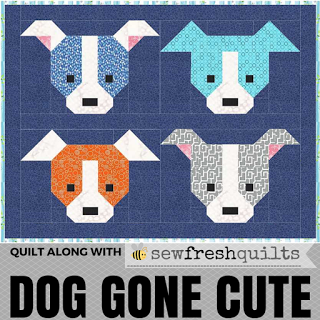 Those little quilts are just lovely! The color combo is just perfect and using stash fabric just finishes it off! You are off to an amazing start with RSC16 and your two quilts are charming. You have a good eye for color and design. Keep up the good work! I wish I had taken her advice and mixed pink in with my browns. It makes a stunning color combination for a quilt. These are fantastic Tracy! Excited to give this block a try. Beautifully done! I'm not typically a pink or brown fan. . . BUT the combo in these quilts is a smashing hit! They are both sure to be loved to bits! Those are adorable and beautiful! Great job! Super sweet and well done! I love the pink and brown color combination. Love this quilt pattern. These are awesome! Love pink and brown together.